Besides travelling by train, I love a good ferry boat ride! I miss the near weekly ferry rides we took while living in Istanbul! 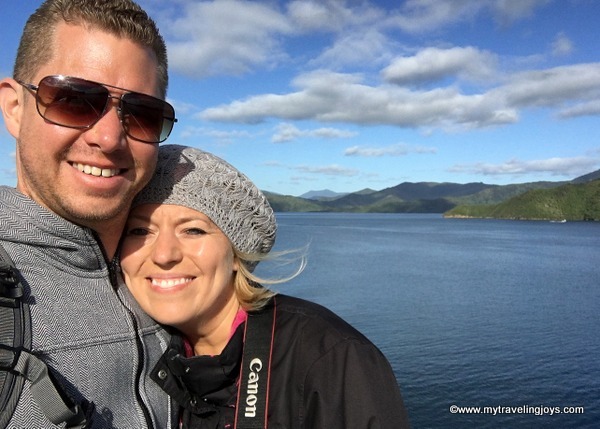 In order to travel between the North and South Islands of New Zealand, we decided to take a 3-hour ferry ride from the seaside town of Picton to Wellington, where we would spend one night. 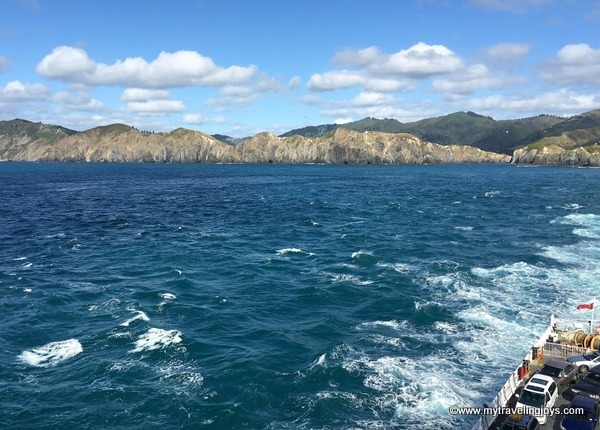 The journey crosses the Cook Straight (known as Raukawa Moana in Māori), which is the connection between the Tasman Sea on the West, the South Pacific Ocean on the East and the NZ North and South Islands. On the morning of our departure, we had a slight snafu when we learned the car rental drop-off was on the opposite side of the port where our ferry boat was. There are two ferry operators – Interislander or Bluebridge – and we had selected Bluebridge simply based on the timing. Luckily, we caught the hourly free shuttle bus to the Bluebridge terminal so we didn’t have to trek 15-minutes with our luggage trailing behind us. 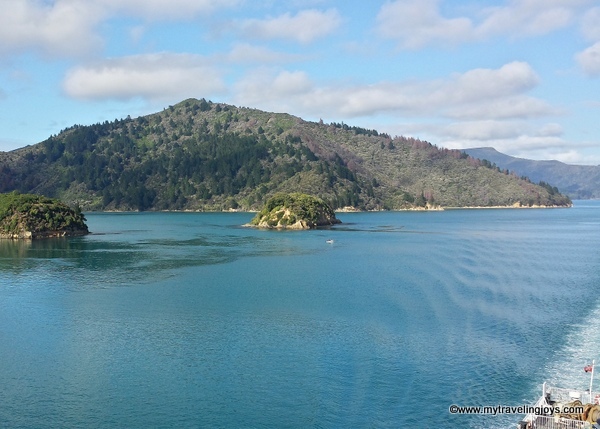 Leaving the port, we were greeted with a gentle breeze, early spring sunshine and beautiful vistas of the Queen Charlotte Sound. The sound is filled with lots of bays, inlets and secret coves as well as sandy beaches, verdant forests, rolling hills and several mussel and oyster farms. The water changes to 50 different shades of blue as you can see in these photos. The surrounding area is absolutely stunning on a clear day! I spent most of our journey outside, taking countless pictures of the northernmost bits of the South Island, every one more beautiful than the previous. Every trip I take hundreds of photos because I never know if we’ll return or not, especially since NZ seems so far away from the rest of the world. This was a solitary farm (see the tiny cows?) in what seemed like the middle of nowhere! Great views, but definitely a different lifestyle! As we prepared to enter the Cook Straight, the winds picked up considerably and waves starting rocking the ferry boat a bit. I took a few more photos of the rocky coastline of the last bit of the South Island before we entered the open sea. The straight is considered one of the most dangerous and has caused many shipwrecks over the years. Not surprisingly, the straight is named after British Captain James Cook who “discovered” Australia in 1770 and thereafter first found this sea passage from the Pacific Ocean to the Tasman Sea by New Zealand. 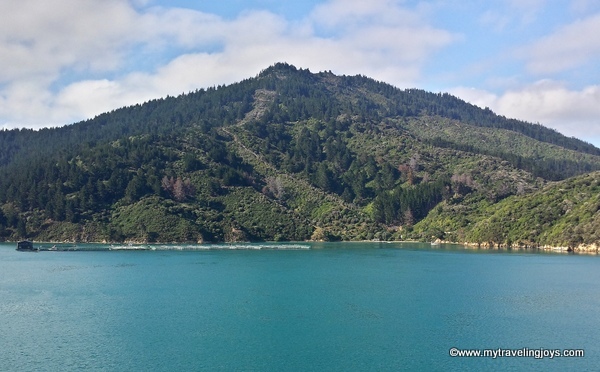 He also sheltered his ships in the Queen Charlotte Sound during his exploration voyages. With the boat rocking, I headed downstairs to our seats. We nibbled on some leftover cheese and crackers and sipped a partial bottle of our Marlborough wine. The wine was needed to calm my nerves, of course, because I sometimes get seasick. The rest of the journey was uneventful and we arrived safely into the Wellington harbor. I was already planning on where we would eat lunch, but that’s another post. Docking at the Wellington harbour. 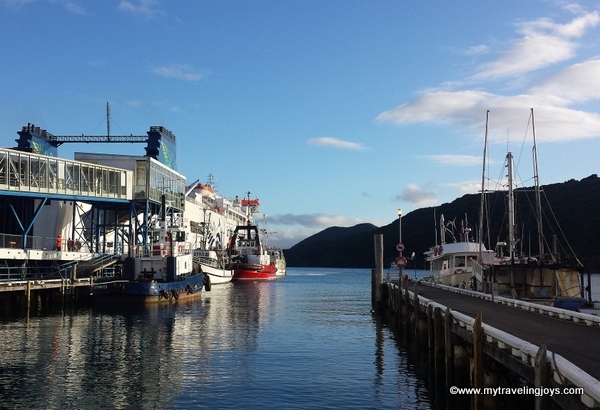 · The ferry boat ride took 3 ½ hours from Picton to Wellington. The boats also depart from Wellington several times a day. 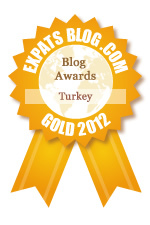 · We booked our tickets nearly a month in advance and some time slots were already sold out. My suggestion is to reserve your tickets in advance if you want a particular time or day. · Our one-way tickets cost 118NZ or about $80USD - $40 per person. A good deal for a beautiful journey on the water! This post is linked up with #WeekendWanderlust by travel bloggers JustinPlusLauren. Hop on over to see more travel stories. Wine to cure sea-sickness! I'll remember that one. @Annie, Wine not! ;) Wè had a lovely journey. Crossing the Cook Straight by ferry is high on my todo list but somehow we have never quite got around to it. The prospect of lucking out and getting a rough crossing has held us back a bit. New Zealand might be a long way for you but it is right next door to us, here in Sydney. You might be interested to know that Captain Cook actually spent a lot more time exploring and mapping the coast of New Zealand than he did in Australia. He discovered Australia but spent very little time here whereas he mucked about in New Zealand for quite a while - months I think.